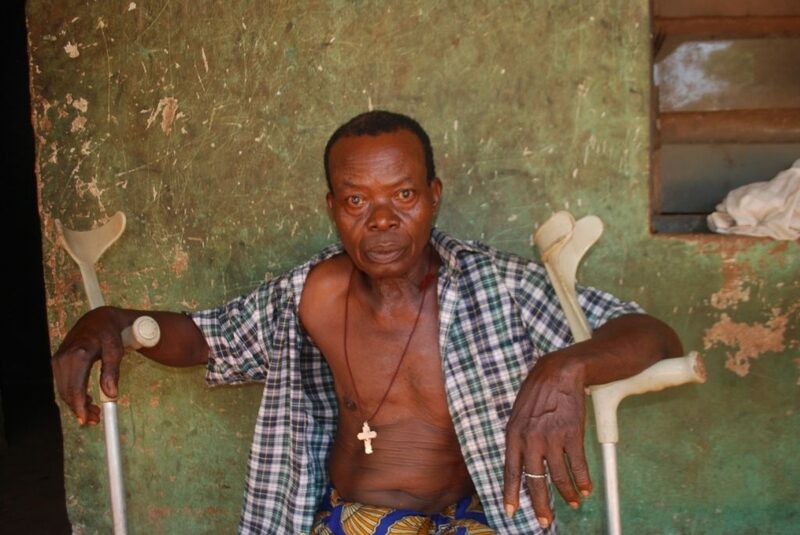 Clinging to his crutches in both hands, Sylvester Egbunna 70, limps to the spot where his dotted T-shirt was hanging in front of the veranda to put on. He moves to a wooden bench which was placed in front of the veranda to sit. His thirteen-year-old daughter is sitting close to him. He had been tying a blue and yellow Ankara wrapper around his waist in the African rural style. A cross hung around his neck. He sighs briefly and adjusts to his seat. “The air doesn’t come all the time here,” he said dragging the two crutches closer to him. “It gets hot inside sometimes, especially on a sunny day. “So I come out here to receive the air in the afternoon,” he said. Fifty years ago, Sylvester Egbunna was twenty years old when he joined the Biafran army after the declaration of Biafra was made by Colonel Odumegwu Ojukwu on May 30, 1967. At the battlefield, he was known by his fellow soldiers and other senior officers as the “Guitar boy” because of his dexterity in pulling the trigger like a professional guitarist would. Others call him “Pagan” because he kills without mercy. “Where my bullet when I die Oh Biafra! Biafra save my bullet when I die”. “This was how we use to sing it during the war. To give us courage and morale,” he said, wiping away some sweat that had gathered in his face with a brown handkerchief. He recalls where he was when the war started. “I was in Uyo with my brother selling double barrel guns and cartridges. 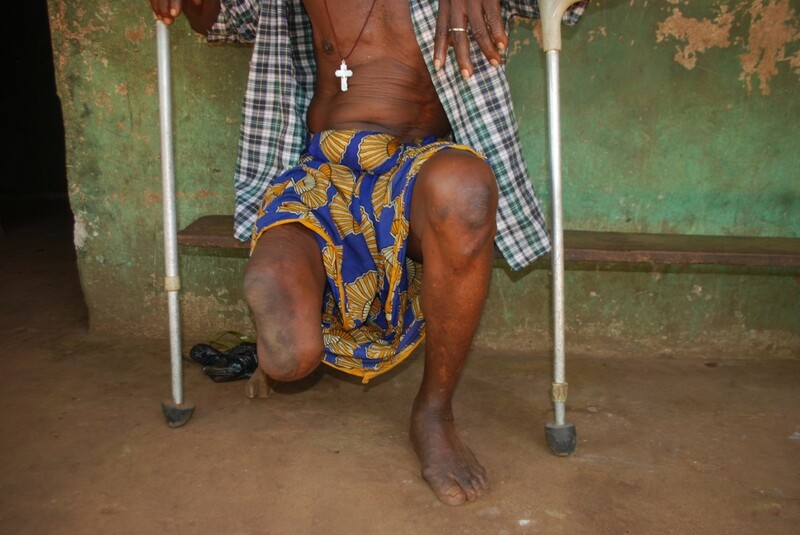 I joined the Biafran army there,” he said holding firm to one of his crutches with the right hand. “I was a stubborn boy then. I didn’t tell my parents that I had joined the army at that time. They only found out when I was injured,” he said. Two days after the “911 operation”, he was not successful this time around. 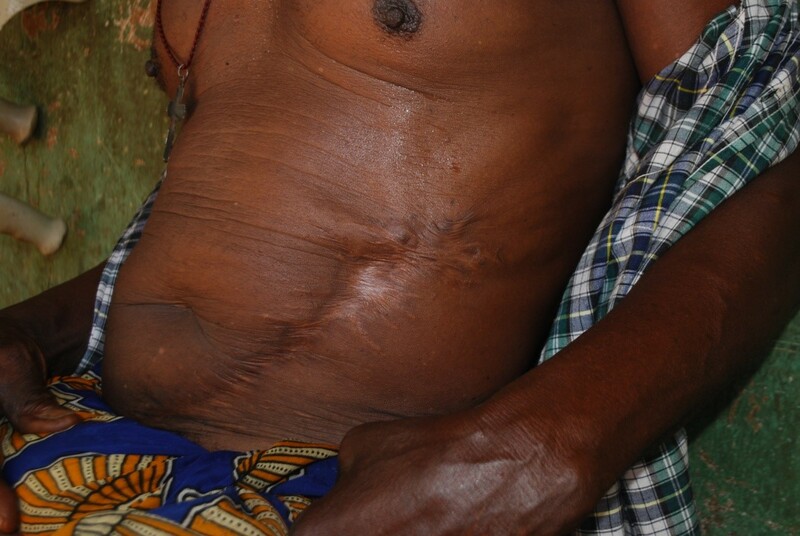 He was hit by a bullet in the leg and a shelling shattered his belly. He luckily survived. “‘Biafra win! War! Biafra win! War!’ was all I was shouting when I was shot down. My spirit was high, I was even ready to go back to the battlefield with my injuries,” he said. “You can see the scars in my stomach. That was where the shelling struck me,’ he said showing me the scars of the bullet and shelling. Due to constant bombing, shelling and the reverberating sounds of guns at the battlefield, Sylvester developed auditory problems. He hardly hears when someone speaks to him unless you whisper in his ear or raise your voice while speaking to him. I had to come very close to him during our interview sessions and in some instances, gesture to him to make him understand my question. He would smile and respond in the affirmative. Sylvester’s right leg was amputated when tetanus penetrated the bullet injury he sustained at the battlefield. “Please don’t cut my leg, I begged the doctor but he told me they will cut my right leg. It was damaging the more by diseases,” he said recalling how tetanus penetrated his right leg before it required amputation.